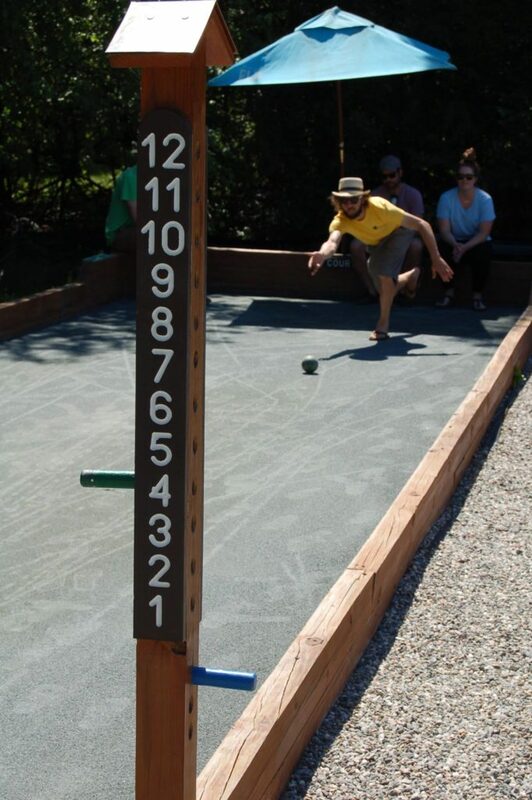 The Burlington Bocce Club plays on the 4 Pro Courts at Oakledge Park in Burlington, Vermont. Just steps from the waterfront. The Club was founded in 2007 as a social and recreation oriented club that is dedicated to providing Burlington a place to gather around the game of Bocce. More about our history is below. The Courts are 80ft x 11ft. The surface is HarTru, the same material used for clay tennis courts. We use 107mm balls, weighing 920grams. We follow US Bocce Federation Open Bocce Rules, with a few minor modifications. Official BBC Rules. Our 200+ member club represents all ages and ability levels. Two courts are currently wheelchair accessible, and the other two are scheduled to be upgraded to accessible spring 2019. The surrounding area is not 508 compliant. The courts are public. If you don’t want to join the club, you can bring your own balls at play at your leisure, except when courts are reserved for league and tournament play. Leagues M-Th 6-7:30PM June-Sept. See Tournament Calendar for dates/times. Individual Membership Dues: Only $20 — Memberships allow you to bring friends, family, and coworkers to play, but non-members can not have the equipment code. Complete the membership form below and mail to Julia Ely (BBC) 322 Bay Rd, Shelburne, VT 05482. Family Membership Dues: Only $40 and cover memberships you and your spouse (significant other), and your children under 18. Complete the membership form below and mail to Julia Ely (BBC) 322 Bay Rd, Shelburne, VT 05482. The club is registered non-profit, all money goes into the courts and equipment. Use of professional imported Italian BOCCE BALLS and other equipment including score-pegs, tape measures, court grooming equipment which is stored a the courts. You don’t have to carry your set around. Our thanks for contributing to the ongoing upkeep of these courts. The volunteer run non-profit club has grown steadily over the years. The project started as a community effort to build two bocce courts at Oakledge Park. Major contributors to this effort included the National Italian American Foundation, North Country Federal Credit Union, Department of Parks and Recreation, The Boznian American Community, Zplace, and countless volunteer hours of club members. A few years after the first two courts were built, a third court was added. In 2013, the Pennies for Parks program helped to completely renovate courts 1 and 2 with much sturdier construction. And in 2016, via Pennies for Parks and club member donations, court 3 was replaced with the new courts 3 and 4. We hope to grow more if we can find the space.